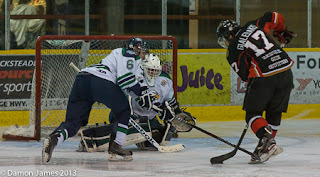 After making the trip to Vancouver Island on Sunday, the Surrey Eagles will take on the Alberni Valley Bulldogs in Game 3 of the Coastal Conference Final on Monday evening at Weyerhaeuser Arena. The Birds lead the best-of-seven series 2-0 after 1-0 and 3-2 wins at the South Surrey Arena on Friday and Saturday respectively. Nic Pierog was a key contributor to the Game 2 win on Saturday. Not only did he score the game winning goal, but he was very strong in the face-off circle, allowing the Eagles to gain possession of the puck at a number of important moments in the game. Surrey's top producing forwards put their names on the score sheet as well. Adam Tambellini, Brady Shaw, Demico Hannoun and Michael Stenerson all had points in the second game of the series. After dropping the first two games on the road, the Bulldogs return to the Dog Pound where they are undefeated in the playoffs as they've won all four home games to this point in the post-season. Evan Tironese is the only Alberni Valley player to beat Michael Santaguida thus far in the series, but the Dogs' offense will be helped by the return of Matthew Hansen in Game 3. The native of Saint Cloud, Minnesota had to serve a two game suspension in the opening two match-ups after an illegal hit against the Victoria Grizzlies in the second round.